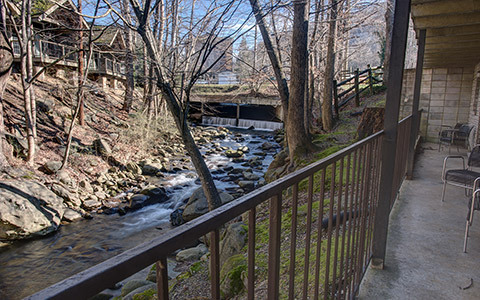 Nestled in the foothills of the Great Smoky Mountains, Brookside Resort has been a fixture in the popular resort mountain town of Gatlinburg for nearly 90 years. The Reagan family established the resort in 1931 and, year after year, welcomed generations of loyal guests who made Brookside their home away from home. We are committed to continuing this cherished family tradition. Many of our guests first came here as children and now their own children and grandchildren are our guests. “City Close – Country Quiet” - it's a phrase that captures our tranquil, ten-acre setting while highlighting our close proximity to Gatlinburg’s favorite attractions. In fact, the Gatlinburg Trolley stops right at our front door. Of course, once you experience our farm fresh breakfast buffet featuring Southern-style “Biscuits & Gravy”, scrambled eggs, waffles and more. You probably won’t be heading out for breakfast early. Afterwards, enjoy the resort’s two swimming pools, outdoor hot tub, eight-foot waterfall, picnic grounds and classic recreational options, including basketball, bag toss, shuffleboard and volleyball. breakfast buffet, 8 - 11 a.m.